I am Brendan Schaper, a professional broadcast meteorology student at Mississippi State University, here to be the bearer of good weather news! 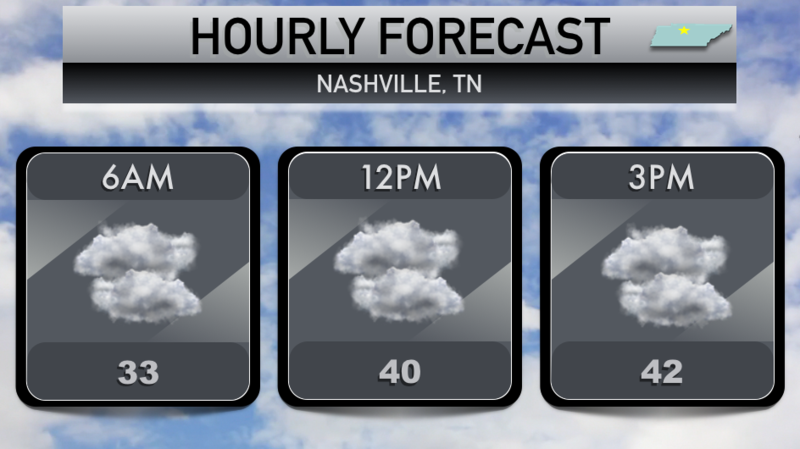 Nashville stays quite chilly today, but temperatures will be climbing back to near-normal Thursday and above average temperatures are expected for the weekend. Another Editor’s Note (AKA Intern 3.0’s Note): Tonight’s setup looks favorable for freezing fog to develop. What is it? Take fog and put it in air with temperatures below-freezing. This leads to a very thin layer of ice on surfaces, like roadways and sidewalks. Couple that with the low visibility that comes with fog anyway, and it turns into a potentially dangerous situation. Please be extra-careful late tonight & tomorrow morning. Yesterday’s unpleasant and chilly rain left us with gloomy skies, which will last through all of today. Temperatures, as mentioned, will stay “heavy coat worthy” with highs in the low to middle 40s. Have no fear — warmer air will soon be here! Okay, maybe not that warm. A noticeable difference in conditions begins Thursday, with temperatures climbing into the middle 50s. This is more typical of February in Nashville. Also, winds will swing back around to the southerly direction, which will be the mechanism that ushers in a flow of even warmer air by week’s end. Low temperatures Thursday night for most locations will be in the middle to lower 40s with a light southerly breeze. 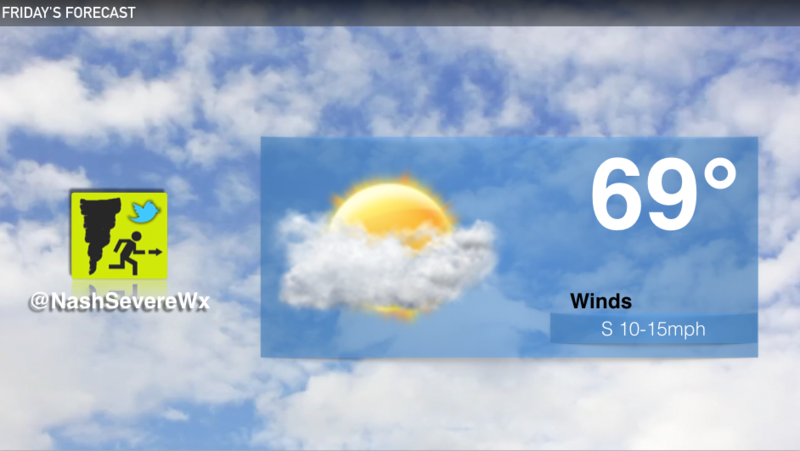 Don’t worry about more than a simple windbreaker on Friday…make it “Casual Day” at work and slide on the flip-flops! But do hold onto your hats: winds will be rushing in from the south at 10-15mph, with gusts upwards of 25mph. While it’s not the “dog days of summer”, 60s in February are a welcomed gift for most. Look for increasing clouds throughout the afternoon, with an almost negligible (20%) chance of showers in the evening. Lows Friday night should bottom out in the upper 40s to near 50°. If you are headed out to see the newly “Grammy”fied Chris Stapleton perform at the Ryman Auditorium this weekend, a light jacket would suffice while walking downtown. Do keep an umbrella handy, though, as rain chances will slowly increase primarily Saturday into Sunday. Hopefully you get the chance to soak in some extra Vitamin D this weekend! Rain Ends Tonight. Slow Improvement On The Way. 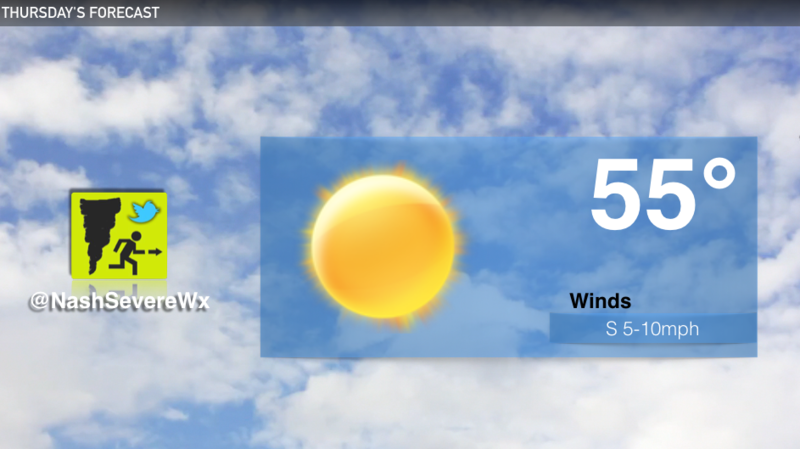 Back to the 50°s!